When a church closes, what happens to the beautiful statues? Since our viewer asked about churches specifically, we’re only going to talk about churches since we could go on forever looking at religious institutions of all types! And even among Christian churches, the answer to this question depends on the denomination. Stained glass windows from St. Angela Church went to Our Lady of Ransom Church. Immaculate Conception on 44th Street in Chicago took the ambo, altar, altar clothes, and convent from the former St. Helena of the Cross Church. St. Anastasia took the tabernacle and holy water founts from the former St. Helena of the Cross Church. St. Donatus took the murals from the former Seven Holy Founders church. St. Mary in West Chicago bought the former St. Mary Magdalene stained glass windows. One extreme example of Catholic art reuse combined elements from two churches to create a new church, St. Raphael the Archangel, in tiny Old Mill Creek, Illinois. Nearly all of the former St. John of God Church was shipped piece by piece from the Back of the Yards neighborhood all the way up to Old Mill Creek almost 60 miles away. Stained glass windows and exterior walls were also recycled from St. Peter Canisius, which was in the north Austin neighborhood. According to St. Raphael, the work is about 85 percent done now, but the new site has already been in operation for a few years. We contacted several Protestant churches of different denominations and most of them said they are not aware of any rules or policies for the disposition or reuse of artworks. 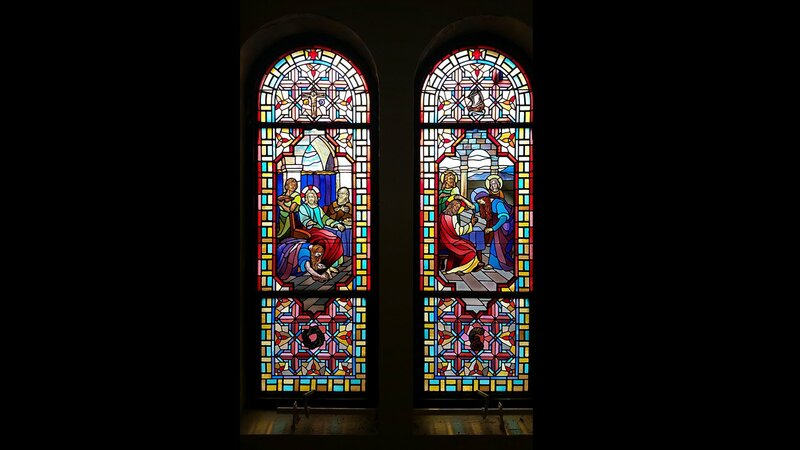 The Lutheran synod said that the individual congregations own the art and windows, so it is up to them how they get used after a church is decommissioned. The proceeds then are given to the synod or to another nonprofit organization as one of the final decisions of the congregation before it is dissolved. If you’re in the market for ecclesiastic art, it’s not too hard to find it for sale. John Duda at Reuse Depot, a salvage company in Maywood, said that when a church is scheduled for demolition, his company is sometimes called in to dispatch a demo team which will salvage whatever elements they think are saleable. Most of the items are architectural elements like pews and doors, but religious artwork often makes its way in there too. There are many auction houses and architectural salvage companies that sell reclaimed religious art across the country. I heard someone mention the St. Joseph’s Home for the Friendless and the St. Vincent’s Infant Asylum and Maternity Hospital and was wondering about their history. The chaos of Chicago’s explosive boomtown growth in the mid-1800s left many children on the streets. Disease and poverty left some children orphaned, and according to newspaper reports of the time, children were sometimes abandoned in Chicago by their parents who were making their way west. Other than the county poor house or reformatories, there was really no government entity at the time equipped to care for all of these children, so private orphanages, most with religious affiliations, were established to fill the need. Among these were the St. Joseph’s Home for the Friendless and St. Vincent’s Orphan Asylum and Maternity Hospital. St. Joseph’s was established in the 1850s at Wabash and Superior as a place for destitute women and children to receive assistance and care. When that location burned in the Great Fire, the institution was moved to the former Soldiers’ Home on 35th and Lake Park. It had been a Civil War hospital. After 1912, that location was used as a “clearing house” for the various orphanages of the Archdiocese of Chicago, a first stop for unmarried mothers and their children. In the 1980s, the name was changed to St. Joseph’s Carondelet Child Care center, and its mission shifted to the care, education, and treatment of children with emotional problems. That program ended in 2005, but the building was designated a Chicago landmark. Today it’s the only remaining building in Chicago with a history directly linked to the Civil War. It’s now called the Cardinal Meyer Center, and some administrative offices are located there. St. Vincent’s Infant Asylum opened in 1881 in a house at LaSalle and Superior Streets. It was established by the Catholic Daughters of Charity to care for very young children. In 1888 the institution moved down the street and expanded its mission to include a hospital that cared for pregnant women. Today, it is home to Catholic Charities, where anyone in need can get social services like food, shelter and counseling. The center still has many reminders of its former purpose, including the original baptismal font. Throughout the first half of the 20th century, reformers led a movement away from institutionalized care in favor of foster care. About half of the city’s orphanages closed by the 1960s. Angel Guardian was the last to close in 1974. Note: This episode of Ask Geoffrey first aired on July 11, 2018.